"I'll soon have two girls, right at 2 years apart. What are your best tips for surviving an infant and a toddler? THANKS!" 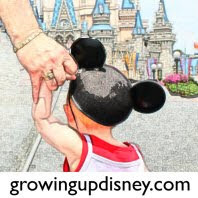 I received tons of great advice and was asked by a Growing Up Disney reader to compile these tips since she will be in the same boat soon. I wasn't planning on making this a blog post, but y'all came up with such great advice that I'd like to share it. Since I didn't declare ahead of time that I'd publish this, I've removed names from the comments. I hope this helps you or a friend. A HUGE thanks to everyone who shared their tips from the trenches. ~put several drinks and snacks out for the toddler. It never failed that as soon as i would start feeding baby, a toddler would want something to eat or drink. ~Well, I had 3 kids in 3 1/2 years. It is very hard but worth every second. Just keep the toddler very busy. Go to the zoo, park or even go to a friends house that has children or vice versa, have your friends come over. Get a mommy's group started & you will be amazed at the accomplishments!!! My kids are 21, 19 & 18 now. Enjoy while they are young cause they grow up too darn fast!!! ~try to include the toddler as much as possible. They can be the wipe holder or go get the diaper. Bailey would help us bathe Eli - she got a washcloth and was at his feet. If breastfeeding, you can read to her while feeding. Make sure to send special time with the toddler while baby is napping. You and hubby take turns staying with little one and take toddler out for some one on one. You don't have to spend money just go to the park or do their favoirte thing at home. Eli also brought Bailey gift for her to have when he arrived. I have a friend who said she went to the dollar store and bought several small things and wrapped them up and when it looked like toddler was about to have a hard time she would pull out a gift for them to open. I think she said that she had 10 things. She said it really helped. ~My girls are two years apart...here's what I know..right now, you wonder how you will do it. When you get to the point I am at (they are now 14 and 16) you look back and wonder how you ever did it. But, when you are "in it"...you just do it. :) I honestly enjoyed that time greatly...wouldn't change a thing. ~Let some things go, ask for help, be reasonable! It will get easier! ~Mine are 2 year apart, and I have learned recently to pick my battles...one more curious george episode won't hurt her while i get the baby to sleep. don't worry about it being Quiet, the baby will learn to sleep through the noise of the 2 year old. ~enjoy every minute and love them loads because before you can turn around twice they are grown up having their own children. love you and hope you are doing great. ~All my advice would be unfounded since I don't have two, but I think you need to abandon that sweet husband of yours and come home for a little while so we can spoil them rotten and let you get some extra sleep. Totally unbiased - I swear! ~My two kids are just over 2 years apart. You need to lower your expectations. But you still do need to make a point to appreciate your older child and let her help. Letting them help thrills them to death, and that can include pulling laundry out of the basket or just fetching you a diaper. ~Try to get them on the same afternoon nap schedule! ~just relax! i know you heard it before w/Tink, but the laundry and cleaning will wait... enjoy the two of them together while you can! And let Tink help as much as possible! She can bring you diapers and help burp the baby and pick out clothes! It will really help form that 'big sister bond' from the beginning that will last a lifetime! but the best tip i got from one of the nurses in the hosp.... UNLESS there is some blood or real danger involved, take care of Tink FIRST! If she needs attention but the baby is crying, go to Tink and love on her... the baby (as long as she's ok and just crying) will be fine, but Tink is old enough to notice who you choose first. It will take the bite out of the jealousy... and it really worked for us! my two little monkeys are best friends! good luck and praying for you Hot Mama!!! ~Same naptime is great! And keep the older one involved with everything - let her help you as much as possible with the baby. My 2 year old LOVED being a "big girl" and helping with the baby. She would also change her stuffed animals or baby doll every time I changed the baby. ~Get organized and try staying on a schedule it provides stability and comfort for the babies and provides grounding for you. You will always be prepared. Make sure to try and rest when they rest. And always have at least one date night a month. If momma ain't happy ain't nobody happy. Good luck. ~TV is your friend - especially at first! ~mine r 25months apart & there were days I didn't think I would make but but now it's awesome! They r best buddies! ~if you get one something, you probably won't hear the end of it unless you get the other the same thing!! ~my girls are 17 months apart. My best advice is have the big sister be a part of everything. ~mine are 23 mths apart. The 1st year is tough, but then it gets easier as the get older and have each other to play with. ~I second it - Coffee, and lots of it LOL! ~I'm thinking gin... Lots of it! ;) how much longer to go for you? If you'd like to add your own tips to the list, please feel free to comment below. It's always terrific when we can learn from each other! This is all awesome advice whether you have one kid or six! Something we're doing to help with the toddler when the new baby arrives is to make sure that she has presents too. Everyone wants to shower the new babe with presents and attention, and we can't leave out the toddler. I've already found a couple new coloring things for her, and we're going to pick out a new book and toy for her to have once the baby comes too. We're also going to shop for big sister shirts so she can share with the world what a special job she has. Also, someone mentioned having snacks available? We do this now for just one child. On grocery day I divide up bags of goldfish, animal crackers, and fruit and keep a couple on the counter for easy access. It saves a lot of running back and forth!